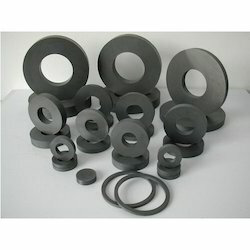 Our range of products include ferrite rings magnet. Pupils can conduct many experiments in electromagnetism, including the manufacture of their own working electric motor. Comprises 8 anisotropic alloy magnets, 8 anisotropic ceramic ferrite magnets, 4 steel magnets, yokes, plotting compasses, hardboard formers, iron fi lings dispensers, bottle of iron fi lings, double C-cores, C-core clips, rings and split rings, support bases, armatures with axle tubes, aluminum axle rods, split pins, rivets, rubber tubing, formers, reels, cellulose tape, reels of Cu wire, white paste board, plain postcards, white cotton, carbon resistors, (10W and 100W), fl ash lamp bulbs, neon bulbs, bulb holders (MES), wood clamps, wood blocks and instructions. Looking for Ferrite Rings Magnet ?